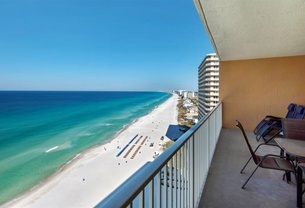 This 2 bedroom 2 bathroom Deluxe unit comes with a picturesque view of the Gulf of Mexico. This owner has recently replaced the couch in this unit with a new updated sleeper sofa that you sink right into. This unit has tile throughout; seats 4 in the living room, 4 in the dinning area, 4 at the bar, and 5 chairs on the balcony. There is a medium flat screen TV in the living room, medium box TV in master bedroom, and a small flat screen TV in the guest bedroom. There is a king bed in the master and a queen in the guest bedroom, sleeper sofa, and twin sized bunk beds in the dinning area. The washer and dryer are stacked. Come on and let the warm ocean breeze sooth your soul. This is a lovely 2 bedroom, 2 bath beach front condo located on the 16th floor. This beach front condo over looks the worlds most beautiful beaches and our pool deck area. This unit does offer tile throughout and large flat screen televisions in each room. The master bedroom opens up to the Gulf of Mexico so you can sleep soundly on your king size bed. The guest bedroom offers a queen size bed. The dining area has bunk beds and this unit does offer a sleeper sofa. This beach front condo is sure to please your family vacation or just mini get away with the spouse.